CBSE Syllabus For Class 7 Science: Students of CBSE Class 7 must have a clear knowledge of the CBSE syllabus for Class 7 Science. This is a must to not only ensure a high score in Class 7 annual exam but also to clear your basics. Having a proper understanding of all the concepts in the CBSE syllabus for Class 7 Science is a must so that you understand the concepts in higher classes without any difficulty. So, we bring you the detailed CBSE Syllabus For Class 7 Science. Go through it thoroughly before starting your preparation for CBSE Class 7 exams. Science is one of the most important subjects for you, especially if you are planning to take up Science in the future. Even otherwise, you will find Science as an interesting subject. This will help you to build a scientific mindset from an early age. 1.5: How Nutrients are Replenished in The Soil. 2.4: Feeding and Digestion In Amoeba. 4.5: Kinds of Clothes We Wear in Summer and Winter. 5.4: Neutralisations in Everyday Life. 10.1: Why Do We Respire? 10.3: How Do We Breathe? 10.4: What Do We Breathe Out? 10.7: Do Plants Also Respire? 15.6: Sunlight — White Or Coloured?. 16.8: Effect of Water Scarcity on Plants. 18.8: Sanitation at Public Places. We have now provided you with the detailed CBSE Syllabus for Class 7 Science. Go through the syllabus thoroughly and finish each and very concept. Do not miss any concept and cover the complete syllabus in time. Start your preparation early and study in a consistent manner. Have a strong over the basics. It will help you in higher classes as well. Solve a sufficient number of questions and take mock tests to boost your confidence. We wish you Best of Luck! for the upcoming CBSE Class 7 board exams 2019. We hope this article on CBSE Syllabus for Class 7 science helps you. 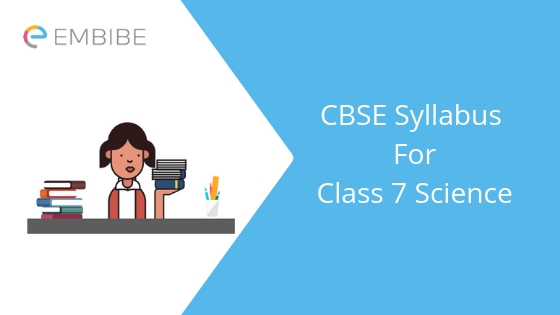 If you have any question regarding the syllabus for cbse class 7 feel free to post it in the comment box below. We will get back as soon as possible.